Join Us in Our Fight Against AIDS — D.R.E.A.M. Today’s post is outside of our usual realm of financial literacy, but still a very important topic to us here at D.R.E.A.M. Health and wealth go hand-in-hand, so it should come as no surprise that D.R.E.A.M. is joining the fight against AIDS. As all of us are aware, AIDS is an epidemic that affects all Americans, however it disproportionately affects low-income and urban communities (our target demographic), where there is generally less knowledge about the disease and few resources dedicated to prevention and treatment. With that said, we thought that it was essential for D.R.E.A.M. to do its part in helping to raise awareness and eradicate AIDS in our communities. Since first diagnosed by doctors in the early 80’s, over 30 million people have been killed by the virus. In America, every day over 100 people of African American or Latino descent contract AIDS. Every hour, seven people contract AIDS. Although African Americans represent 13% of the U.S population, they account for 46% of persons living with HIV. If you found those statistics troublesome, we have a way you can get involved. Here’s how! Please join the D.R.E.A.M. Team and the scholars of "Invest-in-Success" for this year's AIDS Walk New York, and walk with us on Sunday, May 20, 2012 in Central Park. AIDS Walk New York, the world’s largest AIDS fundraising event, benefits Gay Men’s Health Crisis (GMHC) and more than 40 other tri-state area AIDS service organizations. GMHC is the nation’s oldest and most comprehensive AIDS service organization, serving approximately 15,000 people living with HIV and AIDS each year, as well as countless more through its prevention and advocacy work locally and nationally. Register for our team today! PHONE: Call the AIDS Walk office at 212.807.9255 (WALK). Be sure to provide our team name when registering. "D.R.E.A.M. NYC - 2622"
We have signature tee shirts available for purchase for all persons walking with the D.R.E.A.M. Team. Please email info@dream-nyc.org for more information. Q: When is the AIDS WALK NYC? A: Mark your calendar for Sunday, May 20, 2012! Q: Where is the AIDS WALK NYC? A: The AIDS Walk will start and end in Central Park. Enter at 59th Street and 5th Avenue. Q: What is the schedule for the day of the Walk? A: It is 10 kilometers (6.2 miles) and takes roughly two to three hours to complete. A: Yes, you can make a donation and help us reach our team goal. 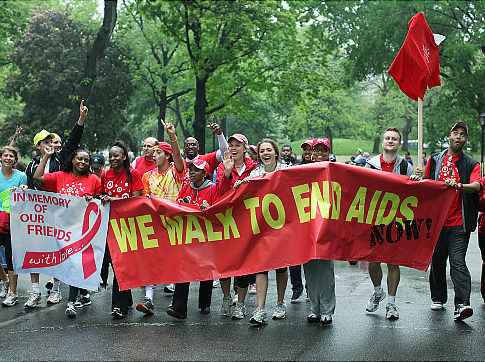 Visit our team page on the AIDS WALK NYC site and make a donation there. *All proceeds will be donated to GMHC and not D.R.E.A.M. Thank you for your support as we embark on this important initiative. We look forward to seeing you on May 20th! If you have any questions, please email info@dream-nyc.org.